Daniel Knight was born at the Royal Sussex County Hospital on the 12th of April back in 1983; he still lives in Brighton and runs his kickboxing equipment company Sidekick alongside his partner Daisy who is expecting his first child soon. 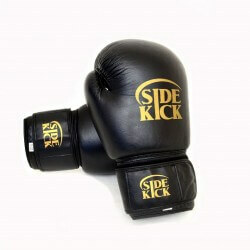 The Sidekick brand has become synonymous with Kickboxing but has spread its wings and also covers Brazilian Jiu Jitsu as well as mixed martial arts equipment. You will see the logo dotted around everywhere as Daniel has never been shy about sponsoring fighters or promotions and has generously given back to martial arts on numerous occasions. Daniel first started to fall in love with combat sports at an early age, after his father left when he was just seven years old his mother who was a keen Karate practitioner would sit down with Daniel and his brother on a Saturday evening, they would all watch Jean Claude Van-Damme movies together and it became a ritual that Daniel really looked forward too. 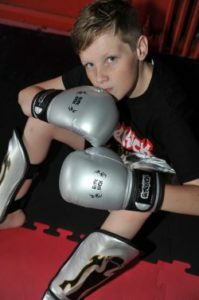 It also inspired Daniel to seek out a Kickboxing gym and to take up the sport. Daniel’s brother Paul had also taken up the martial arts with his discipline of choice being Judo, interestingly now the Knight household housed students of Karate, Kickboxing and Judo – possibly a little precursor to the evolution of mixed martial arts. Daniel explained, “My mum helped me find a club, it was called Sama but is now called Kicks”, He reminisced:“It was a great martial arts centre ran by a fantastic teacher called Chris Kent. I went from a novice to a black belt over six years and had a great deal of fun competing on the amateur circuit, I always knew the sport would always play a big part in my life”. After leaving school Daniel became a Ford automotive refinisher and went on to open his first company which was a vehicle repair centre, but something didn’t feel right to him and. It didn’t matter how much success he had there was still an itch that he couldn’t scratch and wherever he went, it followed. In 2010 Knight sold his shares to his partner and embarked on his dream and vision – Sidekick the apparel company was founded. Things moved quickly, in 2011 not only did Daniel qualify as a professional kickboxing referee, but his new company became a sponsor for the World Kickboxing Federation. 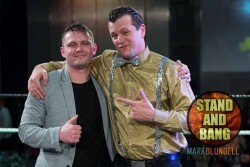 The federation sanctioned a world title fight between the 16 x world champion Marlon Hunt and Jamie Bates – Bates also came onboard as a sponsored Sidekick fighter. Sidekick had quickly become a big player in the Kickboxing industry, it was time to branch out and the lure of the Mixed Martial Arts world was way too big a pool to not cast its rod over. New equipment was designed and then welcomed by the MMA world, soon promotions were using the Sidekick apparel and fighters up and down the country were being seen with the Sidekick logo boldly emblazoned across them. 2012 saw the largest MMA promotion in Europe put on its 11th show; this was to be the first live terrestrial channel showing of mixed martial arts on UK television. Headlining the show on this historical occasion would be the UK’s most famous fighter Alex Reid, a tough bout awaited him in the form of Sam Boo, that night Reid went on to take the win, both fighters were sponsored by Sidekick. Things continue to grow for Sidekick, recently the controversial character and 4 X world kickboxing Andrew Tate was seen on Channel 5’s Big Brother reality show and he has worked alongside Sidekick for a number of years and continues to be a sponsored fighter. These are still early days in the life of the Sidekick brand; every day brings new and exciting deals for Daniel Knight, when asked if he would do anything differently if he could start again, he gave a short and sweet answer, “nothing”. Daniel feels that the company has really found and cemented its place in the combat industry, with a strong working relationship and growing friendship with fast growing Kickboxing promotion Stand and Bang and its promoter Kyle Greaves, Daniel feels there is plenty more success to come. “I have been lucky to meet and work alongside some great people such as Kyle Greaves, Alex Reid and future Jiu Jitsu star Kristie Raby to name just a few of many” Daniel said, “these are exciting days at Sidekick but the possibilities in the future are endless, every superhero needs a sidekick, and you won’t find a better one than us”. Kristie Raby Joins The Sidekick Team. When Daniel Knight, a blackbelt in kickboxing with a wealth of experience decided to start his own fightwear company “Sidekick” in 2010, he only intended for it to be kickboxing attire. As the years passed and MMA became more and more popular Daniel ventured into new products. He went from selling just gloves, shinguards and kickboxing clothing to expanding the business and made his own GI’s, MMA gloves and shorts. It was a risk as it was uncharted waters for him, but a risk that would see his company expand massively and opened up new opportunities as a business, and added many more quality products to the companies name. Sponsoring well known fighters and faces from all different sports, they are recognised as not only kickboxing merchandisers but also MMA, Jiu Jitsu, and kickboxing manufacturers. Daniels dedication and perseverance throughout the years to build the company has paid off and continues to expand and capitalize on opportunities. Coming from a martial arts background himself, Daniel strives to improve products and gives, fighters, coaches and martial arts practitioners the quality they deserve at reasonable prices. That’s what SideKick is all about! When it comes to women’s martial arts and kickboxing equipment we excel in the industry and their is a few reason’s why. When designing for women their are a number of things we take into consideration before finalising the products. We first set out to make sure that the equipment and clothing are made to fit perfectly, and that they are made from comfortable materials stitched together with quality. And lastly, we bare in mind that women always want to look good even whilst fighting or training so we come up with great designs as well. We currently sponsor and have sponsored women who are fighters/BJJ practitioners. We currently sponsor Louise Stevens and in the past we’ve sponsored the likes of Stacey Braithwaite and Kirsty Davis who have both fought at a high level in MMA and kickboxing. Our fantastically designed martial arts and kickboxing equipment sees our customers come back time and time again and we only aim to get better. Try us out if you haven’t already and leave us your thoughts and feedback. Or if you’re a current customer then do the same! What to look for in fight equipment. Some people who want to take up a combat sport are usually enticed into buying cheap and tacky products. As a fighter when I first took up combat sports I made the same mistake, I bought cheap and cheerful rather than listening to advice from people as I never thought it’d matter. Here’s what you should look for. In gloves you should consider a couple of factors, firstly is the padding sufficient for what you’re using the glove for. For instance if you’re doing pad or bag work then 10oz gloves should be fine. If on the other hand you’re using them for sparring then you should opt for 16oz instead. Also you should make sure it has proper wrist support, especially for hard hitters as after a while your wrists may ache or become injured. Another thing is the stitching in the boxing gloves, the last thing you want when you’ve bought a pair is having the annoyance of wear and tear after only a week or two. Gloves are made to protect your hands whilst training or fighting, so make the right decision and don’t let price play a factor in your safety. When looking for shinguards you tend to follow the same principles as the glove. Will they fit nicely and do they have the proper straps to support your legs and stop them from moving around whilst training/sparring. Is the padding good enough to protect your legs and again is the stitching good enough to hold. Also when buying shinguards it’s essential that you have full range of motion in your legs whilst throwing kicks etc as to emulate a real fight. When looking for shorts it’s about the stitching and the quality of materials. Make sure they’re comfortable and that you can move freely whilst they’re on. The basic principals of buying equipment are simple, but many people opt for the cheap and tacky equipment which results in them injuring themselves or having to buy new stuff not so long after. Remember, quality, comfortability and movement! Shop with sidekick to ensure all 3 plus great designs and train safe! Why it’s important to buy the right equipment for your child If your child trains in combat sports such as MMA/K1/Thai boxing, it’s very important to buy them the correct equipment. There’s a few reasons and the most important one being for protection. Although your child is in a combat sport and you expect them to get hurt from time to time, it’s important to have the correct protection so that in training it avoids any risk of injury. For instance if you buy you child very cheap boxing gloves from your local big retail sports shop, their hands might hurt after a week or two and their wrists start to ache. When making the right choice about what to buy your child you should consider quality over price every time. Too many times we deal with people who have went for the cheap and tacky option and ended up having to buy new equipment very soon after they’ve bought it. It may seem like a good idea to the newbie to buy what’s cheap but in the long term it will not benefit anyone and it will likely result in costing more money. The other reason is the cheap equipment doesn’t last long at all. Everyone who’s started combat sports and not had anyone to guide them has probably experienced this. You go out and buy a very cheap boxing gloves and end up needing a new pair within a month or so, there’s no wrist support and the padding is terrible. Then when you get pointed in the right direction and try on a quality pair of gloves you wondered why you ever bought them in the first place. It’s essential to buy good equipment to protect your childs hands/legs etc as they’re also young and still growing. It prevents problems and injuries occurring easily. This is why Sidekick have worked on improving our products since the company started, as the people who work here are mostly fighters and people who train in martial arts. We care about the welfare of our customers and aim to provide what we know is needed. Wondered what our very first glove looks like? Here it is, the very first SideKick gloves. Although these gloves don’t have the official logo, they were the first glove we produced while still in our testing phase. This was while the company was very early in designing our logo, glove designs and everything else that goes with producing the quality that we do. Before we put our glove on the market it went through vigorous testing and review by a lot of methods and appropriate people such as coaches, fighters and martial arts enthusiasts. SideKick have came a long way but one thing that has not left us from the beginning is our quality and determination to provide the best equipment that we possibly can. One mans enthusiasm and passion for the combat sports has evolved what started as a pipe dream into something much more, the leading company in the UK for kickboxing attire, SideKick. I am the third in a line of “Andrew”, but this is my middle name only. I am Emory Andrew Tate lll and this short biography will remove some mysteries of my history. My grandfather, Emory A. Tate Esq (1918-2007) fought in WWll before becoming a lawyer in Chicago during racially charged times. As a Black Man, this shaped his world view and he was a very strict, very hard man indeed. As a boy he pushed a plow with mule through the hard clay dirt of Georgia, forced to work on the farm. At age 12 he pushed a plow that only grown men normally handled. Then he ran away, never to return to the farm. He did some bare-knuckled fist fights as a young man and distinguished himself in hand-to-hand during the war years. His son, my dad, Emory A. Tate Jr. was a young athlete, learning wrestling in school and developing the early forms of Tateshinkai strikes as a youth. His job in the military for 11 years took him on many adventures and little is known for certain, except that my dad never loses. He is my role model in many ways, even as I write poetry like he does. I was born in Washington D.C. at Walter Reed Army Hospital, early one morning Dec 1, 1986. The doctor wanted to award me a perfect 10 on the birth scale, but settled on 9.5. Two weeks overdue, I was nose-breathing already as the doctor held me upside down by my heels and my right fist was inside my mouth as I suckled. The doctor pinched my thigh to get a response, and I growled, knitting my brow and trying to crane my head up to see who had attacked me. The doctor paled, shocked at my defensive powers. I did not cry. I never learned to cry for attention, only used grunts to indicate hunger or discomfort, but mostly I was silent. I had a large, new crib, but most every night I spent asleep on my dad’s chest. He would place me there and sleep still, never moving in the night and our heartbeats were (and are) as one. I learned to defend myself soon after I could walk. Long before my first punch into a pillow, I learned balance, how to step backward after being pushed gently in the chest. Dad made a game of it, a game which ended with a savage shove across a living room, sending me into a dramatic backpedal. I stopped myself with my head one inch from cracking into the far wall. That was the final test. At age 4 I took second place in the county wrestling championships for kindergartners, and Mum swears that I would have won if Dad had been there to shout instructions on how to finish. Dad was working minimum-wage jobs overtime since his military career had been ended. Both mom and dad worked so that we could survive. Things became so hard that we decided to go to England and try a life there, only minus dad. So by age 11 I was man of the house, with a younger brother and sister (plus mum) to look after. As soon as I was old enough I got a job moving 80lb boxes of frozen fish into the market at 5am. Then a full day of school. Weekends found me at the market stall where I perfected my knife skills, flawlessly filleting fish at blinding speeds. After some time I never cut my hands at all, not even a nick. I learned to play drums. While growing up in Luton, raised by a single mother, we endured a lot of teasing because of your American accents. I learned to talk smarter than the bullies, and never needed to raise my fists. When my younger brother beat up the school bully, the boy’s mother came rushing to our house to confront our mum. To our surprise, she thanked our family for finally putting the bully in his proper place. Unlike some great fighters, I have never been in a pub fight or a brawl. I have never struck a person in anger. I credit my mum with so much, watching her struggle to support us and stand behind our decisions. In her way she is fully as tough as anyone I have ever met. She was athletic in her youth, and she punches like a trained fighter! Trust me! Fate introduced me to Amir Subasic and history is made. Bhodukai was a nice fit with the styles I brought from my youth, and all forms were incorporated into Tateshinkai. For the first time, the Dutch have seen a fighter who does not hold his hands high at all times, who rarely uses the “turtle” as a stance. Relying on superior speed and power allows for forms too risky for average fighters to even attempt. Along with my poetry I have retreated to a magical land of Wudan Mountain where I have lived for centuries of human time, learning forbidden arts. I fight merely to demonstrate to others that Tateshinkai is true. My recent fight in China proves that there is interest both in the West and in the East. I was in the top 1% if GCSE scores but I opted to join the workforce and form my own businesses. Also I have won 4 world championships. People think my ideas strange, but I was raised do be an individual. Conformism is not in my genes. I enjoy chess, as my father and grandfather before me. Poetry and beauty in all things. I believe that men were made to be with women. Sometimes my words seem offensive but I only want to be thought-provoking in a world where too many people are losing the capacity to think independently. This is the way I, too, will raise my future children. Daniel Knight is the founder of SideKick and since his early 20’s has been building local businesses as an inspired up and coming entrepreneur. In 2010 Daniel suffered a devastating loss of his beloved aunty to cancer. He hit an all time low and as a result of his loss as understandable. Daniel being the determined, driven person he is did not let ruin him and set his biggest goals yet. While most people would set small challenges, Daniel set a seemingly impossible one, to take the UK Kickboxing scene by storm, and he did just that. He set up a company that sold Kickboxing/MMA equipment, from sparring gloves, to fighting gloves, MMA gloves, Gi’s, bags etc. Daniel isn’t just a retailer in the leading UK fight brand but he’s also graded as a black belt in kickboxing, and has a mountain of experience under his belt. As he felt it was a big part of his life then what better business venture to go on. Before sidekick, Daniel would import other big brands and sell them off before coming up with the best idea he has made to date, SideKick. The company then set off to take over the market, working almost right away with world kickboxing governing bodies. The company went from strength to strength working with champions in all areas of combat sports. As the company grew Daniel decided to start making MMA products such as BJJ Gi’s, gloves etc and another great idea paid off. In 2012 the two first sponsored fighters were chosen, one of them being Celebrity MMA fighter Alex Reid and the other being a world champion kickboxer. The brand appeared on channel 5 in an MMA fight in which Alex Reid was in, the company has never looked back since. Now in 2015 Daniel says the company will continue to strive and grow, with new ideas and new people working with the company it feels more like a family rather than a company. Also SideKick is now endorsed by the most accomplished fighter sidekick have had, 4 time kickboxing world champion Andrew “king cobra” Tate. Daniel says the plans for the future are to break into other sports as well as they have done into kickboxing and continue to help up and coming fighters accomplish their dreams, and work with world champions alike. The reason that SideKick has grown so quickly and been so successful is because of one mans dream to do what he was passionate about. All of the above is a testament to Daniels hard work and commitment and now he knows there’s nothing he can’t achieve. The future is bright for SideKick and everyone involved will no doubt benefit in some way as he is known for his generosity and help to professional fighters and up and coming amateurs. Watch out for sidekick! After a well-deserved break, MMA fighters will be returning next year, with Bellator 132 set to take place at the Pechanga Resort and Casino on 16th January. The main fight card will see Patricio Freire taking on Daniel Straus in an eagerly anticipated clash for the coveted Featherweight Title. Airing live on Spike TV, the match will be a throwback to 2011 when Freire took on Straus at Bellator 45. Dubbed ‘Pitbull’ by his peers, Freire managed to overcome Straus by unanimous decision, making him the Bellator Season 4 Featherweight Tournament Champion and setting him up for a title fight against Pat Curran. While four months is a long time in the world of Mixed Martial Arts, bookmakers are keeping a close eye on Freire to walk away victorious once again. If his previous history is anything to go by, there’s every chance that could happen, with Bellator MMA featherweight champion Freire aiming to become the first fighter in company history to simultaneously hold two belts. The Brazilan bruiser will go into the heated battle as the favourite, having already beaten Straus in the previous fight. However, in January 2013, Freire lost his title fight to 2011 Summer Series winner Curran, but he took the loss with a pinch of salt and pushed on to win the next four straight fights. In doing so, he secured a rematch against Curran in September last year and beat his former rival by unanimous decision. By comparison, Straus also has a similarly rocky history in regards to Pat Curran. In November 2013, Straus took the title when he beat Curran, but his pride would soon take a hit in March this year at Bellator 112, when he was defeated. However, he has reason to be in high spirits for the upcoming match against Freire, as he will be entering the match on the back of a first round knockout at Bellator 127, which saw him defeat Justin Wilcox. The victory was particularly poignant for Straus, who had not had a KO win for four years previously. Earlier in 2014, a controversial announcement was made that would see the end of the MMA’s tournament-based format and instead focus on regular big events as opposed to weekly shows from 2015. As such, MMA fans have only been drip-fed information about the forthcoming events for 2015. The rest of the Bellator 132 card is still to be revealed, but fans are now learning of events coming up in February and March. Bellator 133 will take place at the Mohegan Sun Arena on 27th February, while the Bellator 134 event will go ahead on 27th March at the Winstar World Casino in Thackerville, Oklahoma.